We are in the process of updating our website. As a result, you may see changes in the appearance of our web pages. Additionally, some of our website's features may be temporarily disabled. 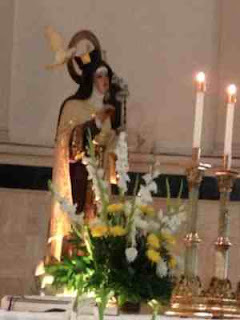 Thank you for your patience while we work to complete this process and thank you for visiting carmelitefriarsocd.org. Welcome to the Provincial Blog. Here, we feature posts by our Friars and by other contributors from the Carmelite family. Our goal is to provide you with content relevant to Carmelite spirituality and life in the Province of St. Therese. To learn more about the people behind this blog, visit the About Blog Central page. To post a comment, just click on the "Comments" link at the bottom of each post or you can send us an email to let us know what you think. If you look out the window of the guest quarters at the Jackson Carmel--in Jackson, MS, that is, in case you're wondering--you'll see standing there on the lawn in front of you a truly magnificent oak tree, assuredly ancient, although quite well preserved, a breathlessly beautiful creature, if ever there was one. Massive in height and width, it spreads out its branches every which way and seems, for all the word to see, more or less like some sort of over-sized fan large enough for a giantess to come along and pluck it up from the ground, putting it to use in cooling herself on a hot summer day. Now there's an image for you, the image of a gloriously mighty old oak tree, its limbs reaching madly in every direction, an image that has about it, at least for me, an inwardly gentle feel or tone to it, like that of a single tonic chord pressed from the piano. I don't worship trees, although if I'd lived in a different age, a shadowy one long, long past, I just might have done so, and done so gladly. But I don't. Instead, I worship the Being, bubbling forth and overflowing with vibrant energy, who, in his eternal mind, conceived, for lack of a better word, just such a wondrous creature. The Being, that is, who has thus given to it its place in this world. And the One who, in each and every moment, loves it and delights in it. I'm referring to God, of course--for lack of a better word--that divine, mysterious, and transcendent Being whose arms, like the limbs of that great oak tree, fan out in every direction, fashioning of himself a steadfast, all-encompassing embrace of his handiwork. 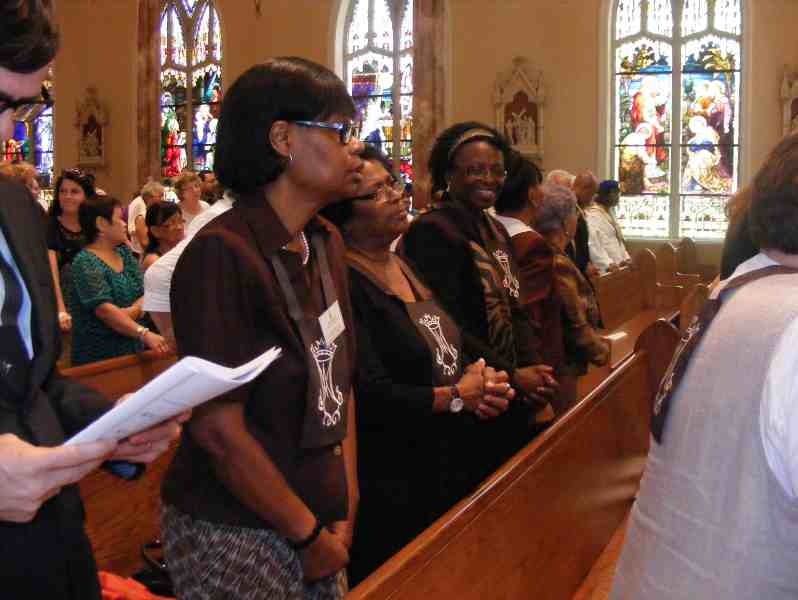 So, a couple of weeks ago, on Saturday, June 6, the diocese of Jackson--that's Jackson, MS, in case you're wondering--honored our Holy Mother St. Teresa of Jesus with a special celebratory mass and reception at the cathedral. The present bishop of the diocese was there to preside, along with two former, now retired bishops, who joined in. In the nave of the church--which was, I'd guess, at least two-thirds full--sat, on the right side, if you're facing the altar, first the Carmelite nuns, then the Carmelite Seculars, then, behind them, to both right and left, various friends of Carmel and other devotees. Lastly, spread out more or less evenly throughout the church, were to be found other interested or merely curious parties and, mixed in among them, still others who'd come drawn by the chance to help themselves to a little free food at the reception afterwards. Oh, I must not forget. 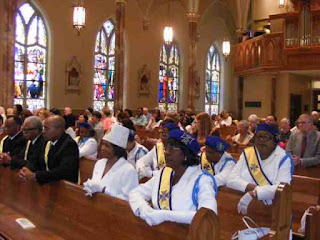 Arrayed in all their glory and finest Sunday-go-to-meeting, on the left side of the church, if you're facing the altar, that is, were, first of all, the Knights and Ladies of the Holy Sepulcher, then the Knights and Ladies of St. Peter Claver. Then, way to the back, the Knights of Columbus stood guard. 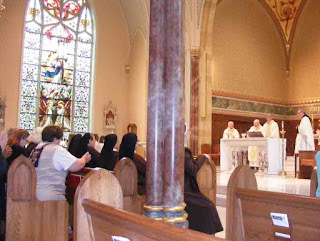 For what it's worth, I was there, too, in the sanctuary--an honorary Dark Night--and I took it upon myself, as instructed, to monopolize the microphone throughout the homily. Holy Mother is like an oak tree, firmly rooted in the earth, that rich soil which was her deeply personal knowledge of God's love. She was a woman, therefore, whose heart, whose soul, whose very flesh, reached upward towards the sun and sky and, in doing so, gave birth to a truly crazy jumble of branches, this magnificently magnanimous outpouring of her spirit which we call Carmel . . .